I recently sat down and had a long conversation with Lennie Rezmer, Carbon Express' Vice President, that simply changed the way I look at archery and arrow selection for hunting. I asked Lennie a basic question, "How do I pick the proper arrow?" I came away with a much deeper understanding of archery performance and equipment. Rezmer believes there are three common mistakes people make when choosing arrows. People spend a lot of money on a high performance bow, and then they go buy cheap, low performance arrows to save money. The arrows will never allow that expensive bow to perform near its capability. People choose their arrows without considering dynamic spine. They just go to a static spine chart and pick a shaft. Many people choose an arrow that is simply too light because all they care about is speed. These arrows can be unforgiving, and if you don't have absolutely perfect form, you likely won't shoot well with them. There's a process involved in selecting the right arrow and it starts with understanding static spine and dynamic spine. Static spine is how much deflection at a 28-inch span a shaft has with a weight of just over a pound hanging from the middle. In other words, how much bend? Dynamic spine is how much that shaft bends, or reacts, at the actual thrust from the string when the arrow is released. In essence, this is how quickly the arrow recovers or how forgiving it is. So now that we understand the two types of spines, how do we use them? Most folks just look at their arrow length and bow poundage to come up with a static spine number and use that to pick an arrow. Rezner showed me Carbon Express' Adjustable Weight Chart. This chart takes in all the aspects of your exact setup, considers in what dynamic spine of an arrow will do specifically, and then adjusts your poundage number so you can go to an arrow selection chart and be more accurate. The Adjustable Weight Chart starts with your bow's poundage, then adds or subtracts pounds for specific parts of your setup and gives you a final adjusted number. For instance, you will gain eight pounds if your draw weight is 60lbs or higher and you have high-energy cams, but you will lose five pounds if your bow has 65-80 percent letoff. There are a number of features to be considered, then you do a calculation at the bottom of the chart and get your final number. You can take that number to the Carbon Express Arrow Selection Guide and easily pick the properly spined arrow for your setup. So after you have done this, there are still many different options of shafts with the various spines. I asked Lennie about this as well. "First, I am a big proponent of Dual Weight Forward Spine. That means that the front end of the arrow flexes more for forgiveness while the back end doesn't flex much, resulting in faster recovery time. This really helps accuracy, especially with broadheads." Rezmer went on to explain, "When choosing a specific shaft, you have to decide what you are doing with that arrow. Are you target shooting and only worried about the fastest and flattest arrow flight you can get? 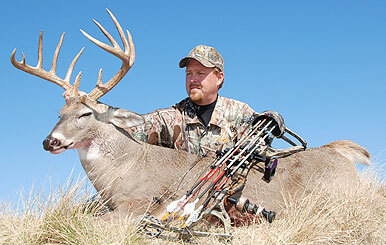 Are you hunting big game like elk and moose? Are you mainly a whitetail and turkey hunter? All these things will determine which type arrow is best for you, and of course you must consider the price." Lennie gave me a couple examples of different situations and arrows that fit the bill for each. First let's look at an adult male that wants to hunt elk. He will need a lot of kinetic energy for a big animal and proper penetration. Lennie said in this situation, the shooter needs a heavy arrow of at least 9-9.5 grains per inch to perform properly. So after finding the proper spine, he can pick a shaft type that fits. In this case it might be a Maxima Hunter KV 350 at 9.8. If this same archer were only going to shoot whitetails and turkeys, such high kinetic energy isn't quite as necessary, so he might want to consider lighter poundage and a shaft like the Maxima Blue Streak Select 250 that weighs in at 7.4 GPI. This will still get all the penetration needed for such animals. Rezmer recommended for youth or lady shooters that are pulling 30-50 pounds and shooting arrows under 28 inches in length, they should shoot a fairly heavy arrow. He said that since they are not shooting high poundage, weight is needed for proper penetration, but also the arrow should still be light enough to fly. He recommends a shaft in the eight GPI range for these hunters. He ended by telling me that if you are going to error, you should likely error on the side of being a bit heavy. This is especially true of novice shooters because with lighter arrows comes more speed, and speed is definitely less forgiving as far as accuracy goes. If you have any flaw in your shooting form and you are shooting a light arrow at smoking speeds, that flaw will show in the form of poor accuracy. Speed can kill both ways. So as you can see, there is much more to arrow selection for hunting than simply matching a couple of numbers on a simple chart. One thing is for sure, if you will take the time and effort to pick the right arrow, your shooting and harvests will definitely improve. The Carbon Express Adjustable Weight Chart makes this whole complicated process very fast and easy, and I know it has really helped me understand arrows and how to use them to my greatest advantage.